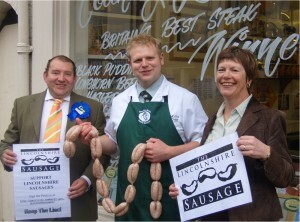 Customers of butchers throughout Lincolnshire are being asked to contribute 5p each time they buy Lincolnshire Sausages. This voluntary ‘Sausage Tax’ is to build a fighting fund, including legal advice, for the application to protect the Lincolnshire Sausage. The Lincolnshire Sausage Association which has launched the initiative has also written to all the new MP’s for the County as well as the new ministers at Defra, Secretary of State Caroline Spelman and Food Minister Jim Paice. The application to protect the Lincolnshire Sausage, launched 6 years ago, has reached a critical stage in that Defra must now decide whether or not to forward the application to the European Commission. Only a handful of companies have objected to the application, mostly large scale food producers and a company which doesn’t even use pork in its ‘Lincolnshire Sausages’. So the consumer is assured of a quality product, made according to a traditional recipe in the area that invented the Lincolnshire Sausage. We have found recipes that contain all sorts of ingredients and additives. Ours contain at least 70% pork, breadcrumbs or rusk, sage, salt, pepper and water (and in some sausages sulphite as a preservative). A premium ‘Lincolnshire Sausage’ sold by one of the leading supermarkets contains more parsley and thyme than sage and has 20 ingredients including Tetrasodium Diphosphate, Disodium Diphosphate, Dextrose, Yeast Extract, Sodium Metabisulphite, Ascorbic Acid and Ammonium Bicarbonate. To support the Lincolnshire Butchers. We have listed all the local butchers on our website making Lincolnshire Sausages, we are fortunate in our county that consumers still use local butchers unlike some other counties where many local butchers have disappeared. The Lincolnshire Sausage made fresh on the premises is a vital part of our butchers’ business and heritage. What do you think? Please leave a comment and say if you would be prepared to pay.